Ever so often I find a great moisturiser worth sharing and this is definitely one. 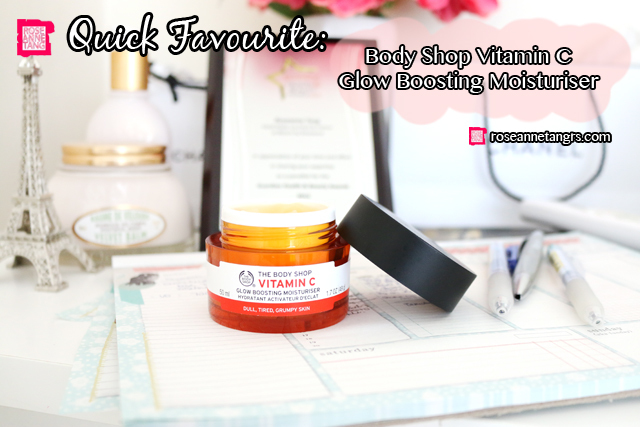 It’s The Body Shop Vitamin C Glow Boosting moisturiser that is The Body Shop’s latest launch. Although at first I did dismiss this as any other hype tooting skincare product when The Body Shop sent it over for me to try it, but after using it for a couple days now, I’m actually really liking it. This moisturiser has a very water-based gel texture that melts into the skin evenly and feels very refreshing. It is not sticky and feels cool to touch. I love putting it on in the morning because it instantly wakens you. I love the smell as well – reminiscent of an orange popsicle although I have to admit when I tried it at the store, I wasn’t a big fan. When applied on the face though, I really do feel the scent is much more pleasant and invigorating. Does it work to boost the radiance of my skin? To be honest, I do see myself getting more radiant but as I have mentioned on my video, I am on accutane and that might just be doing the trick. My skin does feel supple though so perhaps it does do something in that department. Overall, I do feel that this is a solid purchase for anyone with oily skin and looking for a water-based gel textured moisturiser that is an absolute pleasure to apply in the morning.